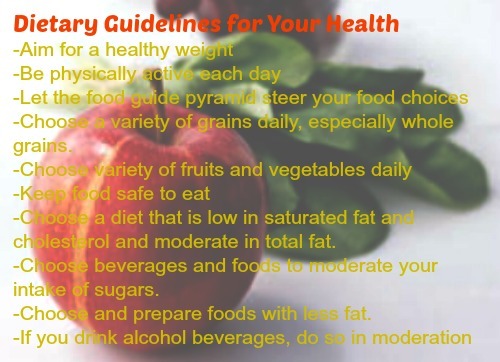 The following dietary guidelines for healthy living can potentially reduce your risk of developing certain chronic diseases. These dietary guidelines can be defined as the ABCs for your health and that of your family. I have summarized them into three goals which are: aim for fitness, build a healthy base, and choose sensibly. Following these two guidelines will keep you and your family healthy and fit. Healthy eating and regular physical activity enable people of all ages to work productively, enjoy life, and feel their best. They also help children grow, develop, and do well in school. Balance the food you eat with physical activity to maintain or improve your weight. Excessive body weight increases the risk for heart disease, stroke, diabetes, high blood pressure, and certain cancers. Many people gain weight as adults, and this can be avoided. To maintain a healthy body weight, you need to balance food intake with the amount of calories your body uses. These four guidelines will build a base for healthy eating. The secret is to eat a variety of foods. No single food can provide all of the necessary nutrients and other beneficial substances in the amounts the body needs. Consult the food guide pyramid to be sure you get the nutrients your body needs each day. Make grains, fruits, and vegetables the foundation of your meals. They contain ample vitamins, minerals, complex carbohydrates, and other substances important to good health and have been shown to reduce your risk of certain chronic diseases. Most of your daily calories should come from these food types. Within each food group, choose a variety of foods. Food items vary, and each item provides different combinations of nutrients and other substances needed for good health. Be flexible and adventurous- try new choices from these three groups in place of some less nutritious or high calorie foods you usually eat. Choose and prepare foods with less fat. These guidelines help you to make sensible choices that promote health and reduce the risk of certain chronic diseases. You can enjoy all foods as part of a healthy diet, as long as you don’t overdo it on fat (especially saturated fat), sugars, salt, and alcohol. Read food labels to identify foods that are higher in saturated fats, sugars, and salt (sodium). Choose a diet low in fat, saturated fat and cholesterol. Reduce fat intake to 30 percent or less of your total calorie intake. Reduce saturated fatty acid intake to less than 7 percent of total calories and intake of cholesterol to no more than 300mg daily. Intake of fat and cholesterol can be lowered by substituting fish, poultry without skin, lean meats, and low-fat or nonfat daily products for fatty meats and whole-milk daily products. This is by choosing more vegetables, fruits, cereals, and legumes; and by limiting oils, fats, egg yolks, fried and other fatty foods. In the same way, choose a diet moderate in sugars, salt and sodium.